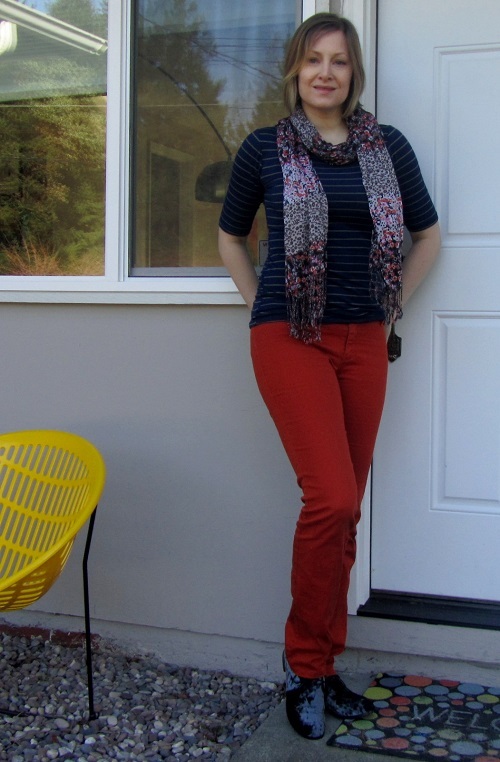 I wear these orange pants a lot, but they’re surprisingly versatile, and I always seems to find new ways to style them. So for now, they’re staying in rotation. This time, I wore them with a striped top and floral scarf. Scarves, I find, are a subtle way of pattern mixing and incorporating extra color into an outfit. My scarf has orange in it so it’s still a coordinated look. And aren’t stripes practically a neutral? And since I was going with the orange and navy theme (possibly my favorite color combo), I thought I’d throw on some blue velvet shoes! Sometimes faux leather is boring and I love incorporating other textures into my footwear, like satin, embroidery, embellishments, and now velvet! These pants were originally boot cut but I felt like they weren’t long enough for that style so I tapered the leg and turned them into skinnies. They aren’t real peg legs, but they’re definitely not boot cut anymore. It’s actually a simple alteration–and you can use an existing pair of slim cut pants as your guide! 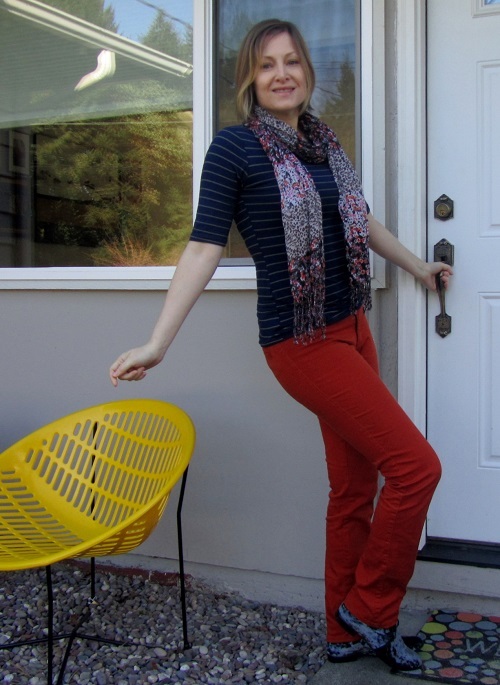 I’ve joined Lena B Actually and Rachel the Hat for their Passion for Fashion linkup. Have a look at what everyone else is wearing! I find myself so often calling things neutrals that I wouldn’t have before. Stripes are definitely in that category lately. So is camo, right? Me too! Leopard? Check! Polka dots? Check! And camo definitely! I love camo and hot pink together, but at the moment I don’t have anything camo. Yes! I was just coming back to add animal prints on the new neutrals list! Love this colour combo!! What a great idea to sew the pants into skinny jeans. I have a pair of boot cut that I will alter too. I think your blue velvet shoes are so cool. 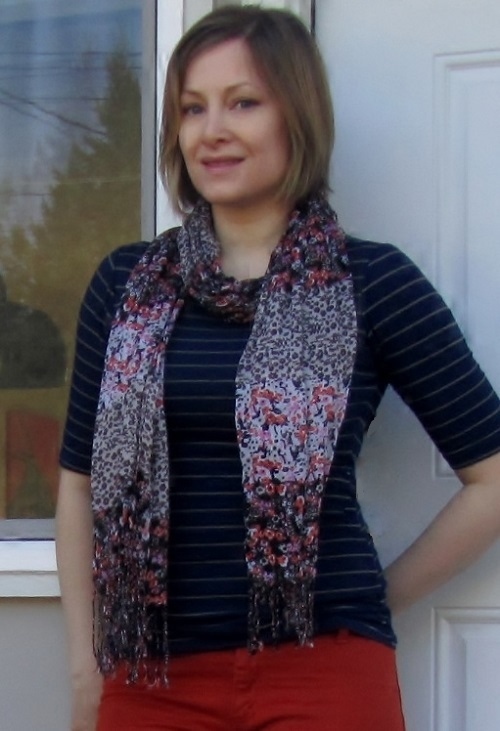 Great casual look and the scarf shows how you can add pizazz to an outfit! Thanks! I’d like to see your before and after. Tapering the pants was as simple as sewing a straight line down the sides (if jeans are top stitched on the outer leg, I’d just alter the inseam to save the nice stitching). I loved the blue velvet shoes when I saw them but admittedly, I haven’t worn them a lot. My new goal is to put them in rotation! I like how you have added the scarf to the outfit- it ties the whole look togehter. I’m visiting from Passion For Fashion! Thanks for stopping by! I’ll check out your blog too. Burgundy pants would be great! And also versatile. I liked colorful jeans more than plain denim. It’s a nice change. Thanks for writing Renae! I’ll wear rainboots this weekend and try to stay dry! What a great color of orange. The orange navy combo looks wonderful on you. I love the fact you turned them from boot cut into skinnies. Very creative. Thanks Brian! It was a simple alteration and really changed the look of the pants! I like this combination. The velvet shoes are unexpected and very cool. 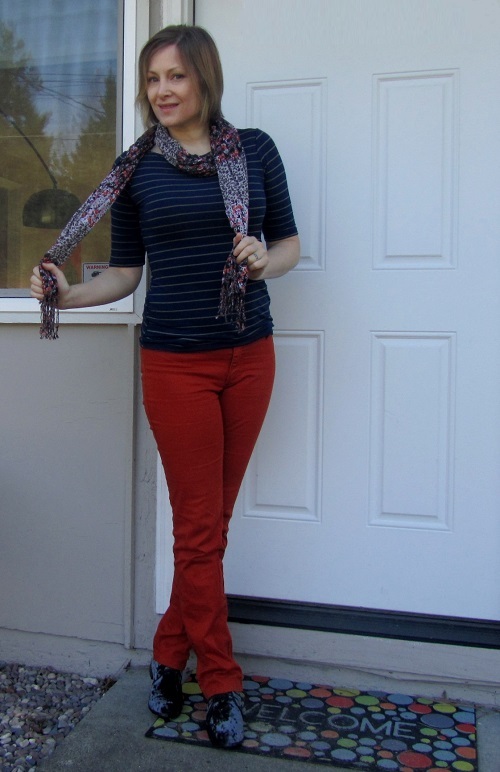 Bright colored pants are so great, especially with stripes and your floral scarf. Very cute casual outfit! Thank you! I like the shoes but have had trouble incorporating them into my wardrobe. I have to get these into rotation more! I do like stripes! And I’m glad I motivated you to get your red pants out and style them too! Thanks for stopping by! Shoes can be a great way to add texture. I often don’t think about them either. That’s my new goal!